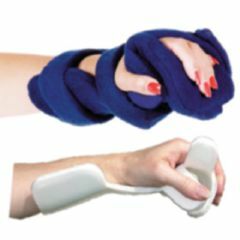 Comfy™ Hand and Thumb Orthosis positions the paralyzed hand after a stroke. Effective for arthritis and disuse atrophy--even with spacticity. Adjust to align hand and thumb in position of function or rest. Thumb abduction wings adjust to fit right or left. Spring-Loaded Goniometer version features a goniometer joint with a dial to set amount of flexion and extension. Fully adjustable frame accommodates deformitities. Custom fit without heat gun or tools. Absorbent padded cover and attached straps are machine washable. Includes one cover and laundry bag. One size fits most adults.